In comments from the White House, Netanyahu said "Israel is responding forcefully to this wanton aggression," while Trump spoke of Israel's "right to defend itself." Netanyahu said he would return home after meeting Trump, cancelling an address to pro-Israel lobby AIPAC's annual conference on Tuesday. A security source in Gaza said there had been a range of strikes in various locations across the enclave. One destroyed a building in Gaza City that Israel alleged was a secret headquarters for Hamas security and intelligence. Residents of Gaza said the building was known to house the Hamas-linked Multasim insurance company. Hamas's interior security office in Gaza City was also hit. So far there have been no reports of any casualties in Gaza. "If there is any violation of the red lines by the occupation, our people will not surrender and the resistance is able to deter it," Hamas leader Ismail Haniya said. Earlier Monday, a rocket from Gaza hit a house in Israel in a rare long-distance strike. Israel's army said the rocket was fired by Hamas, the Islamist movement that runs the Gaza Strip, from the Rafah area. A Hamas official, speaking to AFP on condition of anonymity, denied the group was behind the rocket, evoking the possibility it was caused by "bad weather". The official said the same message had been passed to Egypt, which has acted as mediator between Israel and Hamas. But Israel warned of a firm response and announced it was sending two additional brigades to reinforce the Gaza area and carrying out a limited call up of reservists. Israeli roads near the Gaza Strip were closed and farming activities in the area were halted. Israel also closed its people and goods crossings with the blockaded Gaza Strip and reduced the zone in the Mediterranean it allows for Palestinian fishermen off the enclave, a statement said. The Israeli house hit was located in the community of Mishmeret, around 20 kilometres (12 miles) north of Tel Aviv, police said. The rocket would have had to travel some 120 kilometres (75 miles) from Rafah to reach the area. Rocket fire from Gaza at that distance is rare. The hospital treating the wounded said seven Israelis were injured lightly by burns and shrapnel, including three children. One of the wounded was a six-month-old child and six of them were members of the same British-Israeli family. The house was destroyed in the wake of the rocket and subsequent fire, with burnt wood, a children's toy and other debris piled at the site. Police spokesman Ami Ben David said air raid sirens wailed at around 5:15 am and the home's residents made their way to a safe room, possibly saving their lives. The rocket crashed through the roof and then exploded when it hit the floor, he said. The flare-up comes after mounting tensions in recent weeks. 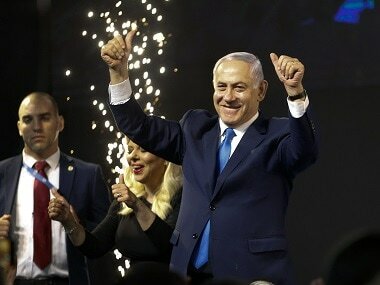 Israel and Hamas have fought three wars since 2008, and Netanyahu is believed to want to avoid another one with unpredictable results ahead of the elections. 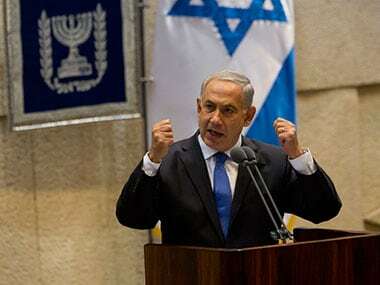 But he faces a tough challenge from a centrist political alliance led by former military chief Benny Gantz and came under pressure to react firmly. Monday's rocket followed another rare one on 14 March in which two rockets were fired from Gaza towards Tel Aviv. No damage or injuries were caused, but Israel responded to that and further rocket fire by hitting what it said were around 100 Hamas targets across the Gaza Strip. 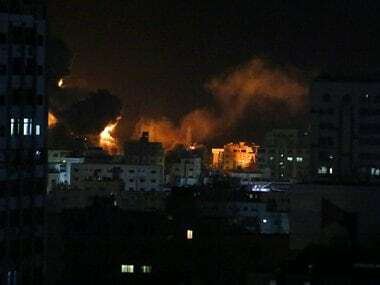 Four Palestinians were reported wounded in those strikes. Both Hamas and Islamic Jihad denied they were behind the 14 March rocket fire towards Tel Aviv, raising the possibility they were launched by fringe groups. Saturday also marks the first anniversary of Palestinian protests and clashes along the Gaza Strip's border with Israel. An informal truce between Hamas and Israel had led to relative calm along the border, but recent weeks have seen another uptick in violence. 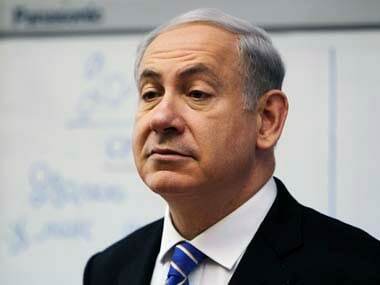 Netanyahu's visit to the United States included Trump's formal recognition of Israel's sovereignty over the Golan Heights, which it seized from Syria in the 1967 Six-Day War.